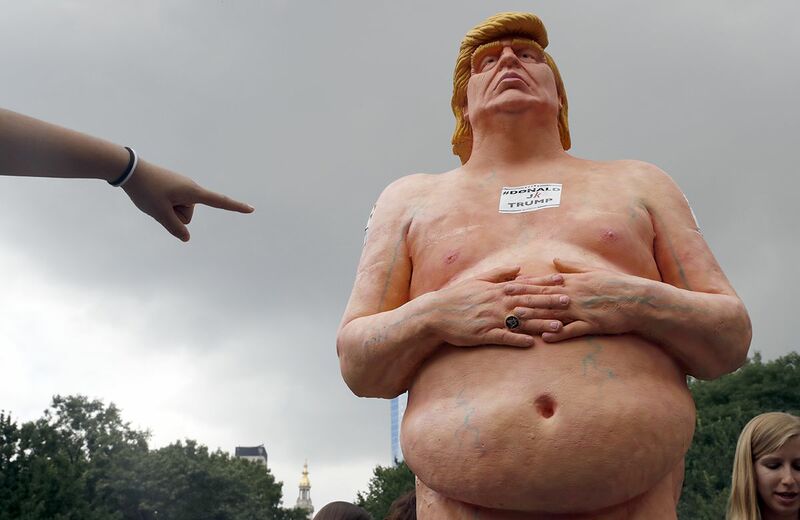 UNION SQUARE, Manhattan (WABC) -- Bizarre and explicit statues depicting a naked Donald Trump appeared in five U.S. cities Thursday, including Union Square in New York City. The statues were placed by a group called INDECLINE, an activist collective that says it's vehemently against Trump becoming president. The group put a plaque at the bottom of each life-size statue that says "the emperor has no balls." 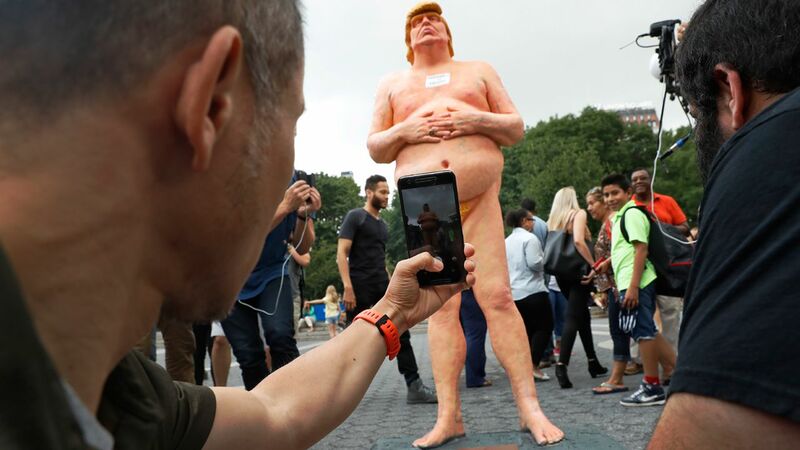 The base and feet of a statue of a naked Donald Trump is all that it left after New York City Department of Parks & Recreation employees removed it, Thursday, Aug. 18, 2016. That title seems to go along with how the statue was designed, as some parts of male genitalia seem to be missing. The statues, which were made by an artist in Cleveland, appeared in these other cities: Seattle, Cleveland, San Francisco and Los Angeles. The statue at Union Square Park in Manhattan drew significant attention, with many people gathering around to take photos. But it was removed rather quickly by the parks department. Watch video below to see a parks staffer removing the statue and throwing it in the back of a truck. WARNING: GRAPHIC VIDEO | Watch as a parks worker throws a naked Donald Trump statue into the back of a truck at Union Square in New York City. The New York City Parks Department issued a statement Thursday, saying "NYC Parks stands firmly against any unpermitted erection in city parks, no matter how small." A woman points at a statue of a naked Republican presidential candidate Donald Trump, Thursday, Aug. 18, 2016 in New York's Union Square. Mayor Bill de Blasio was asked about his thoughts on the statue. "That is a frightening thought," de Blasio said. When he's wearing clothes I don't like him. I can only imagine what he's like without clothes." De Blasio added, "of course we are not going to let people put up ad hoc statues." Trump's campaign has declined to comment on the statues.